Making your office a greener space and reducing your carbon footprint is something that companies across the country and throughout the world are keen to do. Yet, when they come to make a start on their environmental policy, it can be rather daunting. Where to start? What to look out for? How to make changes? These questions and many more are asked but not always answered. So, here are some tips on how to make your office an eco-friendlier place to be. 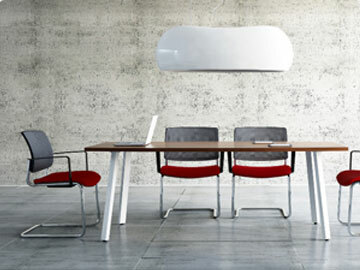 Office furniture is a great place to start when trying to convert your office into a more ‘greener’ environment. When shopping around for office furniture, it is important to choose office desks and chairs that don’t use up energy and natural resources when they are manufactured. You should consider purchasing office equipment that are sustainable, environmentally-friendly and are certified by third parties. You won’t be stuck for these as there is a wide variety of eco-conscious manufactures and online stores out there that specialise in the provision of ‘green furniture’ to fit any budget. If you’ve been reading to the end of the emails you receive, you may well have spotted a message that asks you to only print the email if absolutely necessary. It’s a good idea – paper waste is terribly bad for the environment. Yet, offices still produce so much paper waste that the message just doesn’t seem to be getting through. It could be because there isn’t really a reliable alternative to filing documents where everyone can get to them. Or rather, there wasn’t a reliable alternative in the past. However, ‘the cloud’ now exists and documents can be accessed anywhere, anytime. If everything that once was printed is stored there, then everyone should be able to access it and you won’t be wasting any paper either. There are a number of benefits to reducing your energy consumption. The first, of course, is that you will be helping the environment and becoming a much eco-friendlier office. The second is that you will also be saving money because when you use less energy, you pay less too. You can then re-invest that saved money back into your company in terms of marketing, for example, and grow. Studies have shown time again that workers who sit near to natural light sources are the most productive. That’s because natural daylight helps to keep your body’s circadian rhythm under control so that you know when it is day time and when it is night. If your body can’t tell the difference because you’re under indoor lighting all day, it may become confused. This can result in either extreme tiredness during the day (because your body thinks it’s night) or sleeplessness at night (because your body thinks it’s day). Try to bring in as much natural light to your office as possible and your productivity levels will immensely increase, and the health of your employees will improve. In terms of being eco-friendly, the more you can utilise natural light, the less energy you’ll be consuming each day. When you are looking into buying new computers, printers, phones, photocopiers or any other piece of equipment for your office, make sure they have an energy saving label or notice on them. This means they work as economically as possible. Even your current machines that aren’t necessarily built to be eco-friendly will most likely have a power setting that allows them to ‘go to sleep’ when they are not being used. These are just a handful of tips to becoming an eco-friendlier office but there are many more out there. Why not try get your office to master these and see how much energy you save?